A week ago they cancelled school and today it is back in session, though I’ve heard rumors that another storm is coming. Here in Northwest Arkansas, we face ice storms in the winter. Roads everywhere are sheets of ice and driving is scary. We didn’t drive anywhere for 6 days. With the news yesterday afternoon that school was back in session today, we ventured out. Even with Matt driving so carefully, we slipped here and there. I’m not sure what your December is like, but my December involves lots of things to do. Lots of these things are done at home … except the supplies to do them come from stores. Stores that I can’t drive to. Today Matt drove my vehicle to work, so I am home again today. I’ve caught up on some good sleep. Hallelujah! The kids have had a chance to really relax and play. Cougar (10 months) has had a chance to keep to his natural routine, instead of a routine dictated by mine and his sisters schedule. We’ve been together as a family. I’ve gotten a number of projects done that weren’t on my to do list. Let’s see, I cleaned out my broom closet. Terrible picture, but you get the idea. Ha! Matt and I went through the office shelves together and got rid of 3 small/medium boxes. And I re-organized office supplies into cute little bins. Prepared the bins for the change out of how we will store the dress-up clothes in our theatre/playroom. My kids destroyed the playroom during the week of sudden vacation. Next time we get a moment, we’ll get that corner sorted into the 2 new bins and get rid of the broken toy chest and laundry basket. It is already de-cluttered, so just messy. Yep, I have 4 kids and this is my life! I’ve gotten rid of more stuff from my craft room. Making space (figuratively and physically) for taking my creativity in new directions in the New Year! It has been fun playing around with the configuration of this closet. I’m not done yet, but I’m liking it better. So if you’ve been wondering where all my Christmas posts have been … wonder no more. Anything fluffy or non-essential got crossed off the list. No worries. All my essentials are safe and sound under my roof tonight. 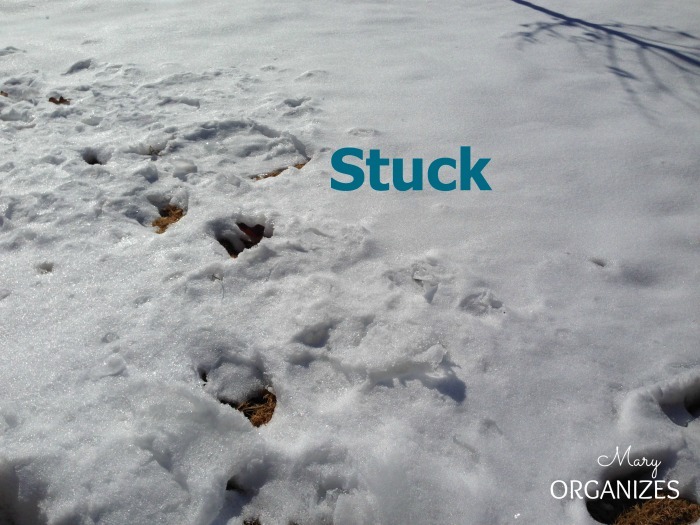 Life is good and sometimes being “stuck” isn’t so bad. Why Does Everything Have To Be So Special?! Love all your wonderful ideas it keeps me on my toes! How are you taking your “creativity in new directions”??? I ask this because I have noticed that I have supplies for crafts that I “need” to do but don’t “want” to do…So I’m wondering if I should keep them and just do them or get rid of them…Thoughts? Get rid of them and move on. Crafts are a creative outlet. The joy of that is erased when we coerce ourselves to do it. Do what you enjoy. My craft tastes have changed, but someone else will like what I’m getting rid of! I would like to know what the categories you have chosen for labeling your crafts closet, i see colored pens and pencils, but cannot make out the rest. I’ve got 3 big bins of decorations all mixed and thrown together, tried labeling some things, but some things require much less space than others. What items would you store together, or do you store and label each type of item separately in separate containers? BTW, lovely indoor flower garden.